The importance of this distinction is evident from Coleridge’s redeployment of it in other terms elsewhere in the Biographia: “Could a rule be given from without, poetry would cease to be poetry, and sink into a mechanical art. It would be μóρφωσις [morphosis], not ποíησις [poiesis]” — shaping, not making. 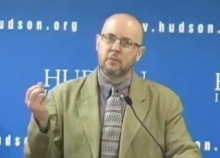 Roberts, whose background in classics serves him very well as an annotator of Coleridge, points out that “when Coleridge uses [morphosis] in the Biographia he has in mind the New Testament use of the word as ‘semblance’ or ‘outward appearance’, which the King James version translates as ‘form’” — mere form, as it were, mere appearance. And it may be also that Coleridge is thinking of the New Testament uses of poiesis and its near relations as well: for instance, when Paul writes of human beings (Eph. 2:10) as poiesis theou — “God’s workmanship”; God’s poem. (You might have to right-click or control-click on the image and open it in a new window or tab to see it properly.) 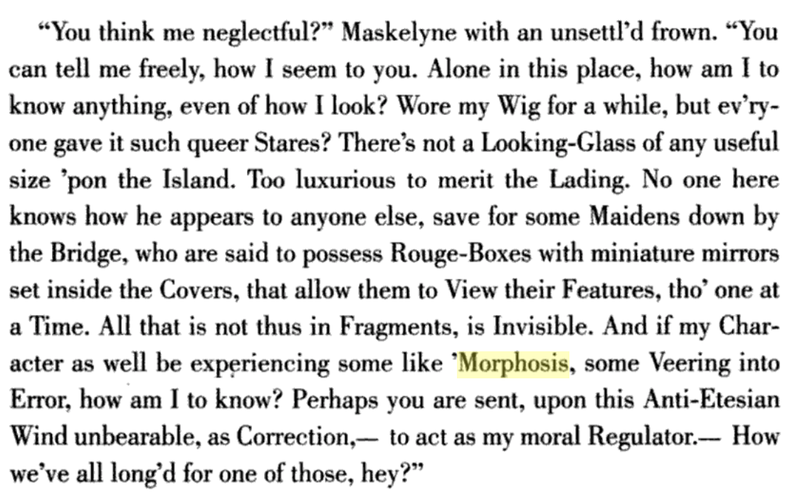 The very bottom is the first relevant thing here, since, in the passage earlier cited from Mason & Dixon, the apostrophe at the beginning of the word suggests that it is an abbreviation of "Metamorphosis" — and indeed, all five uses in the novel employ the apostrophe. 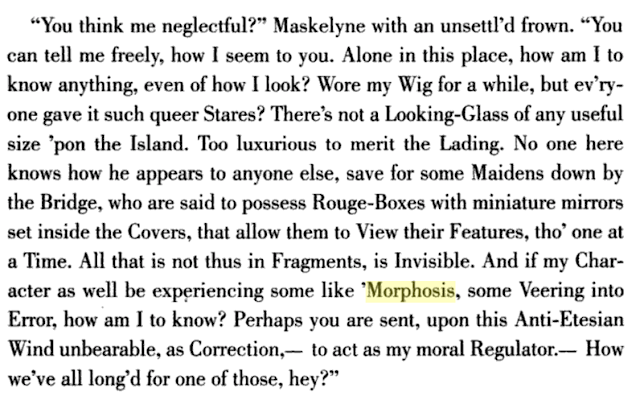 But it's also worth noting that Maskelyne — this is Nevil Maskelyne, the Astronomer Royal from 1765 to 1811 — clearly uses the word in a pejorative sense: morphosis is "veering into error." (I can't help being reminded here of the root meaning of hamartia — the New Testament word for sin, and Aristotle's word for some trait of the tragic hero that no one has ever been able reliably to identify — is to "miss the mark." This is all very Pynchonian, who is obsessed with vectors, especially tragic ones.) And most of the meanings of morphosis listed in the OED are either subtly or clearly pejorative: John Owen's identification of Catholicism as an inadequate morphosis of true faith, which is clearly derived from the biblical meaning of mere semblance; but also the medical sense of a "pathological" or "morbid" change of form — the most obvious example of which being a malignant tumor, which is nothing other than unchecked morphosis: the healthy organ does not so change, but rather retains a stability of form and function. What makes all this especially interesting for the reader of Mason & Dixon is that three of the five uses of the term occur within a few pages, and all refer to Vaucanson's famous Digesting Duck, who plays a significant role in the story by virtue of having become animate and articulate: the duck refers to this as his 'Morphosis. And this should call to mind an earlier post about the Bad Priest in V. and her "progression towards inanimateness." To be animate, to be organic, is necessarily to undergo morphosis, and so life itself, in this account of things, is therefore intrinsically malignant, cancerous. The view shared by the Bad Priest and the animate duck is perhaps the opposite of that articulated in the famous closing sentence of Darwin's Origin of Species: "There is grandeur in this view of life, with its several powers, having been originally breathed into a few forms or into one; and that, whilst this planet has gone cycling on according to the fixed law of gravity, from so simple a beginning endless forms most beautiful and most wonderful have been, and are being, evolved" (form being, of course, μορϕή). For the Bad Priest evolving, changing, is itself an evil — perhaps the root of all evil — and certainly not something to take delight in, as Darwin did. Of course, the only real way to get this sort of freedom and safety—to escape the hassles of earthly life—is to die. And what I think we see in these advertisements is an appeal to a desire to be dead that is evidently felt by many people. These ads are addressed to the perfect consumers: the self-consumers, who have found nothing of interest here on earth, nothing to so, and are impatient to be shed of earthly concerns. After all, the perfect "earth space capsule" is the coffin. Pynchon's novels return again and again to this fear or hatred of organic life, of time and change, not to celebrate it, but to understand it. I suspect that for him this repulsion is at the heart of technological society, of a culture-wide compulsion to trust in and defer to the inorganic and the human-made — which is, ultimately, a form of idolatry: as the Psalmist says, "They have hands, but they handle not: feet have they, but they walk not: neither speak they through their throat. They that make them are like unto them; so is every one that trusteth in them." There is much more to be said about all this, and I hope to say some of it in this book on Pynchon and theology that I am trying to write. For now I'll just note that my respect for Pynchon's acuity on all these matters — respect that was already verging on awe — has just been significantly increased by my reading of Jessica Riskin's astonishing book The Restless Clock. I can't say too much more, because I have just written a lengthy review of Riskin for John Wilson's forthcoming joint Education and Culture, and I'll link to that review in due course (probably in a couple of months); but the combination of reading Riskin and reading Pynchon has seriously altered my understanding of the last five hundred years of intellectual and cultural history, and has significantly intensified my belief that the only truly theological account of modernity is one deeply immersed in the technological history of this past half-millennium.